Location o the Lithuanie SSR athin the Soviet Union. The Lithuanian Soviet Socialist Republic (Lithuanie: Lietuvos Tarybų Socialistinė Respublika; Roushie: Литовская Советская Социалистическая Республика, Litovskaya Sovetskaya Sotsialisticheskaya Respublika), kent as the Lithuanie SSR an aw, wis ane o the republics that made up the umwhile Soviet Union. It existit frae 1940 tae 1990. 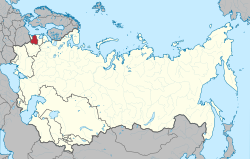 Established on 21 Julie 1940 as a puppet state, durin Warld War II in the territory o the previously unthirlt Republic o Lithuanie efter it haed been occupied bi the Soviet Airmy on 16 Juin 1940, in conformity wi the terms o 23 August 1939 Molotov–Ribbentrop Pact. Atween 1941 an 1944, the German invasion o the Soviet Union caused its de facto dissolution. Housomeivver, wi the retreat o the Germans in 1944–1945, Soviet hegemony wis re-established, an existit till 1990. This page wis last eeditit on 24 Februar 2019, at 21:05.